Sometimes individuals come into your life for a reason. People’s paths cross and they are meant to know one another. This is was most certainly the case with my friend Holly. I met her 20 years ago in high school, I did not know then what an important role she would have on my life later on. Holly Schmitt Costa is my baking mentor, she is my go to person when I have a question about Italian American cookies and biscotti’s. Is she a trained pastry chef, no? Does she have any formal training in the culinary field? Not really. However, Holly has something that trumps a degree from a culinary arts school. She had an Italian mom who owned a cookie business. She learned all of the tricks of the trade and knows all of the secrets there are to making amazing cookies. Her knowledge can rival that of any bakery shop owner when it comes to the subject of Italian cookies. 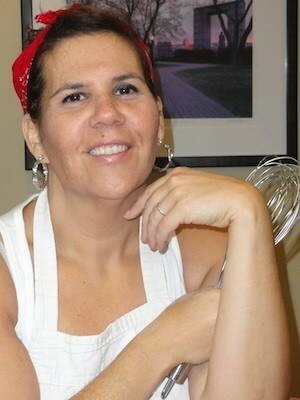 Like many Italian children, Holly grew up in her mother’s kitchen, watching her make cookies. Gladys Scalesi Schmitt, was a beautiful baker who turned her passion into a successful business. Much like her daughter, Gladys had learned to bake from growing up in her own mother’s kitchen. It is these recipes that Gladys used when she began baking and started her business. Holly told me that at the age of four, her parents bought her an easy bake oven so “I could bake in the kitchen alongside my mom”. Around the age of nine that Holly started to actually help her mom bake cookies. Gladys’s cookies were famous, and soon the word about these tasty treats spread. Holly recalls growing up and seeing “cookies all over the house and there were always cookies around”. During the holidays, Holly told me “it was a crazy time because there were cookies and baking supplies everywhere in the house”. Gladys Scalesi Schmitt never had a formal business back in Rhode Island, it was all word of mouth. She made cookies for friends, family and loved ones. There were cookies trays made for weddings, communions, holidays and various celebrations. 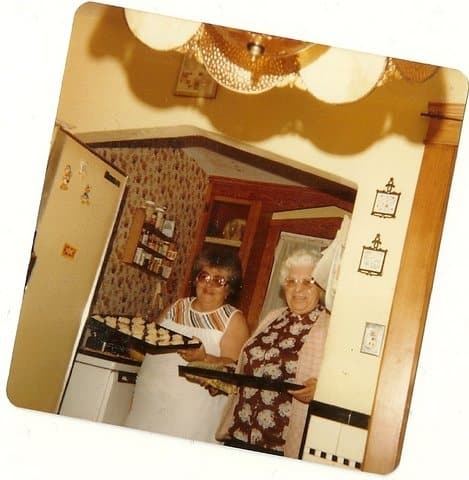 If you wanted good homemade Italian cookies, Gladys was the person you wanted to see. Holly never brought a store bought cookie in her lunch while we were in high school; that is just something that was not done. She grew up eating the most wonderful cookies, just like her children are doing now. Holly possesses these magnificent baking genes and she is an amazing baker. She is carrying on the tradition of making Italian cookies like her mother and grandmother. 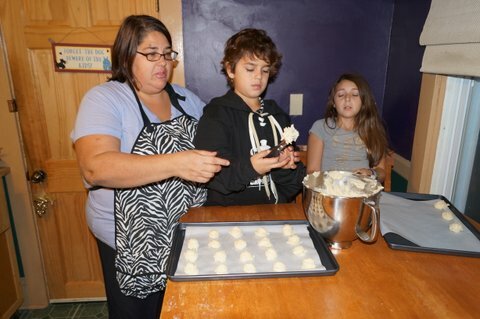 At the holidays Holly gathers her children, Isabella age 11 and Jacob age 9, to bake the cookies. For Holly this is very important to her. Not only is she is keeping up the holiday traditions but also passing along the family recipes and baking secrets to her children. There is one particular cookie that Holly and her children really enjoy making, it is the Ricotta Egg Biscuits (Ricotta Cookie). Using her mother’s recipe Holly will make this cookie for holidays, it is a family favorite. Holly tells me that when she makes the Ricotta Egg Biscuits, she will usually have to make a double batch because her children love to eat them so much. These little confections can go by either name, Ricotta Egg Biscuits or Ricotta Cookies. There are also two ways to eat them as well; frosted or unfrosted. It all depended on how you were raised and how your family made them. Some families never frosted them while others did. The cookie is not an overly sweet tasting one. The ricotta cheese blends well in this recipe and provides a light, palate- pleasing cookie. Whether you eat them frosted them or not, eating one of these cookies is truly a delicious treat. According to Jacob Costa, who is the official taste tester in the family, they are better with the frosting. Isabella Costa, who is second in command in the kitchen when it comes to baking the Ricotta Egg Biscuits, also likes the frosting on her cookies. Holly will make a simple frosting made of confectionary sugar and milk that will lightly coat the cookies; it adds an extra layer of flavor and texture to it. She will also dust them with decorative sprinkles once the frosting is applied. These cookies are easy to make and will be the perfect addition to any holiday tray. Frosted or not, they are a delicious cookie with their light vanilla flavor. They freeze very well, so you can make a big batch and keep them in the freezer. They go perfectly with a cup of coffee because of their mild taste, so pull some out when you have company over for a visit. They make the prefect cookie to share for a cookie exchange, or whip up a plate of these and they make a phenomenal hostess gift. Trust me when I tell you that your friends and family will love these cookies. 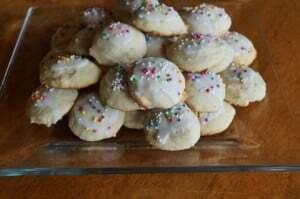 Holly was kind enough to share her mother’s recipe for the Ricotta Egg Biscuits (Ricotta Cookies). I hope that you enjoy making and eating this cookies as much as I did. You can substitute vanilla extract with anise or lemon flavoring!! !